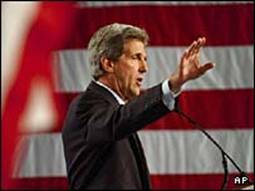 It was Tuesday, January 27, 2004 and the most unusual political fest in American presidential politics was in full force. The New Hampshire Presidential primary was coming to a close. In this small state, there is a population of only 1.2 million people, with the largest metropolitan city, Manchester at 107,000 and the capital of the state, Concord, with only 40,000 people. The largest hotels in the state were the Holiday Inn at Manchester with 250 rooms and the Holiday Inn in Concord with 122 rooms. Here in this tiny spot on the globe, the entire national media of America with all the major network anchormen and political pundits were crowded into the lobbies and bars of the half a dozen hotels large enough to host a private meeting. All the candidates were on the street available to the entire public for a handshake and a few words of political wisdom. At this moment of time, the most usual upset in national politics was about to occur. If we adhere solely to the history of the Brit Hadassah (New Testament canon) by reading only the Acts of the Apostles, we learn very little about the life of the Nazarene congregation much less their role in religious politics in Judea. From the resurrection of Yahshua haNazarit (Jesus of Nazareth) in 30 CE and the destruction of Jerusalem the forty years between 30 and 70 CE, the ministry of the Hebrew Nazarenes in the Book of Acts is centered between the relationship of James the Just, the nasi or high priest of the Nazarenes and the Apostle Paul as the Apostle to the Gentiles. The foundation of the Nazarene congregation began with the death and resurrection of Yahshua and the nomination of the brother of Jesus, James the Just as the nasi, the president of the Nazarene Sanhedrin and the high priest of the Hebrew Nazarene Ecclesia of Jerusalem. A traditional image of the Apostolic Ecclesia was that it struggled to maintain its identity in its early formative years only to have the ascent of the Gentile Christian Church eventually usurp the role of the Jewish Ecclesia (aka Jerusalem Church) and eventually the Hebrew Nazarenes faded into history. Yet twenty five years later, 55 CE, the party of the Nazarenes had its major synagogue located at the Tomb of David on the hill called Nea Zion. It was reaching its maturity and influence in the Jewish temple culture before the destruction of Jerusalem. The Apostle Paul was at the peak of his evangelistic missionary thrusts to the middle and eastern Mediterranean seaboard. The Apostle Peter had already traversed the world from Babylonia, Rome and Celtic Europe. The Apostle John was establishing the twelve churches in Macedonia. Over on the western isles of the West, the disciples of Joseph of Arimathea, family of Caradactus, the Arch-Pendragon of the British, the most feared warrior against Rome, had arrived in the city of Rome as slaves only to be used as Nazarene missionaries to establish the first Christian Church in Rome. Back in Jerusalem the storm clouds of the future appeared to be ominous as progressive disorder and violence were erupting in the province of Judea. In the midst of this era, two major events happened: the Apostle Paul was almost stoned to death in a riot in the temple and James the Just, brother of Jesus was stoned and bludgeoned to death by the temple priests under the leadership of Ananus son of Ananus. All people are privileged to have friends to give a special touch to life. In all the serious contemplation, the great theological gems, the gut wrenching news as we contemplate the “time of the end” and the trembling hearts as we look up to God and say, “I believe in You and I trust in You, we then reach up to God and say, “may I ask a few more questions?” Then along comes a friend to put life in a different perspective. One of these friends is “Don” whom we call “The Eagle”, who has a large email family. Here are a few of his gems. Of the stature of the fullness of Christ. What amazement and awe we feel when we read and study about the invigorating lives of the apostles of Jesus. In the scripture and in the historical documents especially in the peri-Mediterranean lands and the European continent with the western isles of Britain, Ireland and Scotland, we witness the surge of their powerful witness throughout the breadth of the Roman Empire. What was the source of that embolden message sent to the nations of the world? What was the secret of the perpetual vigor of the saints in the Apostolic Nazarene Ecclesia in Jerusalem which many called the Early Christian Church? We try so hard to act like, duplicate or mimic what we feel the spiritually empowered apostle was like. In frustration we ask, why can not we be like them? We want our lives to be spiritually invigorated and our church or congregations to be spiritual powerhouses for the ministry of God. For most of us it is obvious that a spiritually vigorous congregation cannot exist except that it is filled with spiritually vigorous saints. You and I are what give our community of believers a sense of existence. When we search the landscape at all the communities of believers, we find a lot of highly powered commercially choreographed churches but are they spiritually invigorated believers in Yahshua the Son of the Living God? Would they follow Jesus Christ if He came to visit their church during any weekend service? BibleSearchers Reflections is a spiritual ministry of Robert D. Mock MD and the ‘BibleSearchers’ as we build ministries with all who are seeking the return of the Messiah or Moschiach of Israel. We seek to speak with all the children of Abraham, whether Jew, Christian or Muslim. The restoration of Israel and redemption of the saints are all part of the message of the prophets. We are but BibleSearchers searching for literal clues to the unfolding Drama of the Ages that is upon us at the ‘time of the end’. We hope you will let us share our Biblical research ministry with you. If what we are sharing is valuable to you and your life and you wish your friends, relatives or pastors to participate, you may give us their email addresses and we will invite them to join, BibleSearchers Reflections. This site contains copyrighted material the use of which has not always been specifically authorized by the copyright owner. We are making such material available in our efforts to advance understanding of environmental, political, human rights, economic, democracy, scientific, and social justice issues, etc. We believe this constitutes a 'fair use' of any such copyrighted material as provided for in section 107 of the US Copyright Law. In accordance with Title 17 U.S.C. Section 107, the material on this site is distributed without profit to those who have expressed a prior interest in receiving the included information for research and educational purposes. For more information go to: http://www.law.cornell.edu/uscode/17/107.shtml.